(Bloomberg) -- Competition among bankers to win mandates in Europe’s leveraged finance market will get fiercer this year, raising the prospects of more deals with excess leverage and weaker protections for investors creeping into the system. 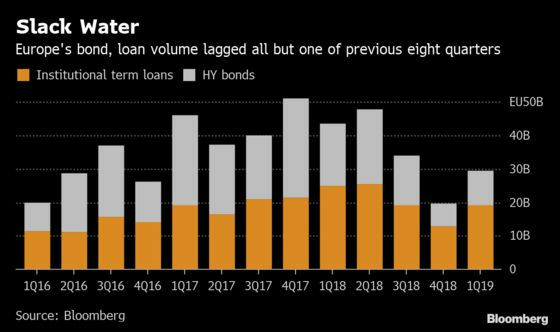 A combination of lower M&A activity and high funding costs pushed first-quarter issuance volumes down 33 percent year on year across speculative-grade bonds and leveraged loans, according to data compiled by Bloomberg. With low expectations for a pick up in supply -- especially for jumbo M&A deals -- in the coming months, overall deal quality is bound to suffer, bankers and lawyers said. Underwriting fees may be cut further at a time when banks are under pressure to meet higher year-end targets, which in turn could help fuel even more aggressive lending practices. In a recent example, last month’s $10 billion debt deal backing the buyout of a unit of Johnson Controls was hailed as one of the most aggressive ever seen. Bond and loan covenants have caught the eye of central bankers and regulators. Bank of England Governor Mark Carney told U.K. lawmakers earlier this year that there’s evidence of a “steady decline” in underwriting standards. Meanwhile, ELFA, a new investor lobby group, is campaigning for better terms and transparency in the leveraged finance market. Some law firms advising sponsors are striving to make documentation more borrower-friendly with every new deal, according to an arranger who asked not to be identified. The senior banker also said that while it was thought that this trend had reached its peak, there was room for it to get worse. While investors have pushed back on some loan and bond transactions with egregious terms and high leverage, discipline is disappearing and the hunger for yield is creeping back in, according to Ted Goldthorpe, managing partner and head of credit at BC Partners LLP. A term loan for animal health business Ceva Sante Animale SA last month was notable for its particularly high leverage. And earlier this week a loan financing from Exact Software was marketed with 7.1 times leverage. “Documentation in deals is definitely getting loser again as a result and we may see things like EBITDA, leverage get pushed," Goldthorpe said. It’s not only investors who are disadvantaged by the levels of competition. Bankers said they are facing greater pressures to drop their fees to arrange deals in a bid to win market share. In recent months a larger portion of arrangers’ fees have also been swallowed up by “flex terms,” which occur when pricing is increased on a new loan to attract sufficient investor interest, they said. The entrants of lenders in the the private debt space are also muscling in and will intensify competition in an already overcrowded banking market, according to BC Partners’ Goldthorpe.